You may have lost an earring, or you might have stumbled upon a pawnshop clearance sale featuring mismatched jewelry from different sets. Should you take advantage of the grab-bag opportunity to own interesting pieces of bling? As with fashion where it is understandably safer to stick with just one pattern or solid colors when wearing matching sets, going for mismatched jewelry might feel like pushing the style envelope. However, if you have the kind of personality, career, and opportunities to pull off wearing mismatched jewelry, it can become a great way to express yourself. Here are a few creative tips to do so. Forget about throwing away earrings whose pairs have gone missing. 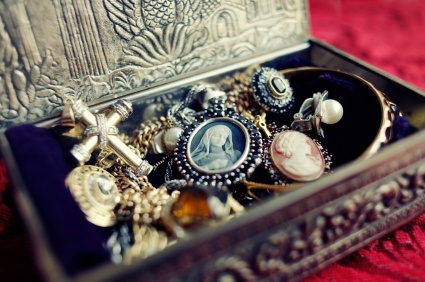 They can be re-purposed into brooches or pins to wear on scarves or collars. You might have to do some DIY jewelry crafting to incorporate clasps or screws on the earring, or else take out the spike that goes through earring holes so it doesn’t hurt you. When done correctly, though, you can be sure to have a piece of jewelry that’s unique and interesting. Don’t be afraid to wear pieces that come from different jewelry sets. You can still have a harmonized look as long as you stick to one precious metal. For instance, a simple silver necklace can be beautifully matched with a chunky silver bangle or ring. A brooch set in yellow gold can be offset by a gold watch. There really are no strict rules to this practice, although it would be wise to stick to the “less is more” approach so as not to overwhelm your outfit. For a bohemian look, why not wear different rings on one finger? It will create a fascinating layered effect and provide a focal point that cannot be achieved with wearing a different ring on each finger. To pull off this look, it’s best to go for bands so that they fit snugly on top of one another. Select rings of different-hued stones for a truly colorful statement. This particular tip might be a bit daring for some. It is a look more associated with the punk lifestyle, as layering accessories and having multiple piercings are part and parcel of that particular subculture. However, when done with deliberate restraint and careful coordination, wearing earrings in just one ear can work for you. If your hair is long, gather it up on one side and secure with a hair tie or a clip so one ear is exposed. You can then choose studs with different colored stones to put in your multiple earlobe piercings, or choose earrings with clasps to decorate your entire ear.